Chronic obstructive pulmonary disease is a chronic lung disease that develops over time due to many different factors. The airways leading to the lungs become inflamed and thicken. This obstructs the flow of air and impairs the exchange of oxygen. Other common names for the disease include emphysema and chronic bronchitis. 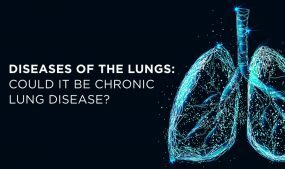 Are there known causes for COPD? Smoking is a well-known risk factor for developing chronic lung disease. Over time, exposure to irritants and toxins leads to damage of the lungs and airways. According to the American Lung Association, cigarette smoking causes about 85 to 90 percent of all COPD cases. Additional risk factors include environmental exposures such as dust, fumes, chemicals and secondhand smoke. Some people may inherit a specific genetic abnormality called an alpha-1 deficiency that prevents the body’s ability to produce a protein that protects the lungs. Treatment consists of multiple different resources, including medications. Many different inhalers provide the airways with a steroid to decrease inflammation. Some people may require supplemental oxygen. Just as in physical therapy for rehabbing joints and musculoskeletal problems, there is pulmonary rehab to work and increase lung function. COPD places patients at an increased risk of respiratory infections. An annual influenza vaccine is recommended to protect against the flu. The Pneumovax® vaccine can prevent 23 different strains of pneumonia, which is an infection of the lungs.